Never be left without the proper tool for the job with the 3.6V Lithium Cordless Drill and 121 Piece Accessory Set by Stalwart. 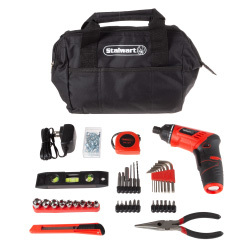 The accessory set has everything from screwdriver bits to wood and metal drill bits. 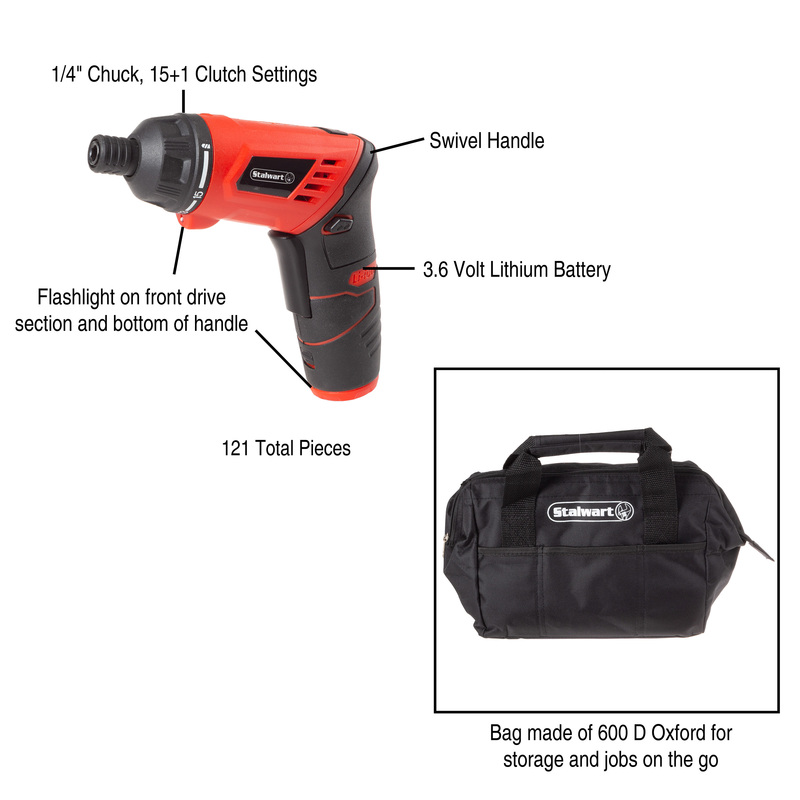 The drill itself is powered by a 3.6 Volt Lithium Ion battery that gives a longer use time and holds a charge better than Nickel-Cadmium batteries. The handle is ergonomic and comes with a rubberized coating to enhance comfort and reduce user fatigue. The drill has a 1/4” keyless chuck for fast, convenient bit installation and removal and 15+1 torque settings for precision drilling and driving in any material. The entire kit comes in a 600D Oxford cloth carrying bag to keep the accessories organized and make the kit ideal for travel. 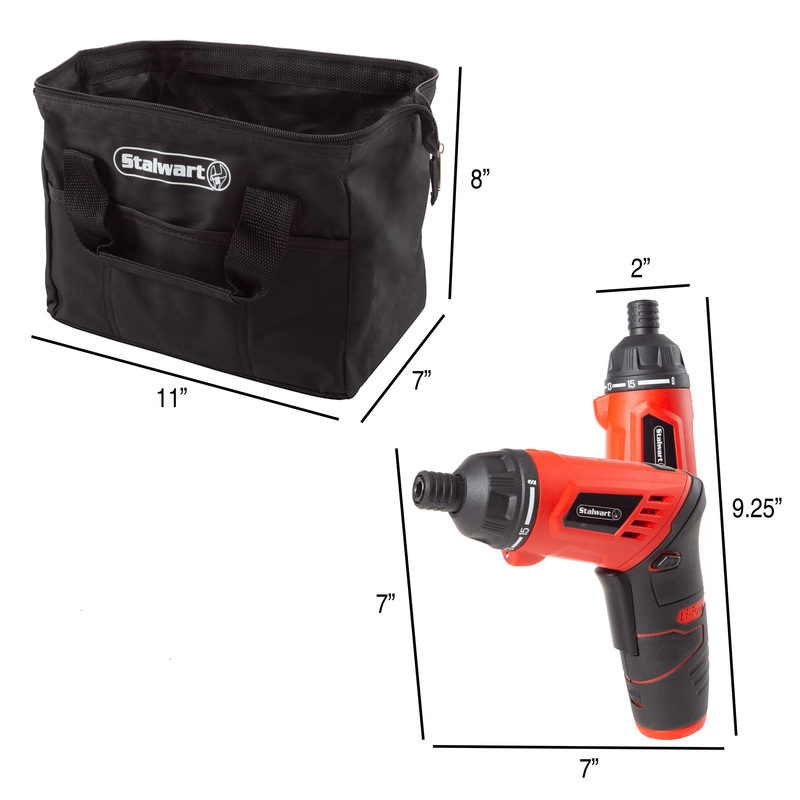 The top of the bag opens extra wide to provide easy access to your drill and accessories. The built-in LED light turns on when the trigger is pressed, providing extra light in dim areas. The drill has a swivel hinge in the handle to use either at an angle or to extend your reach in small areas. KEYLESS CHUCK- This drill comes equipped with a 1/4” keyless chuck for fast and convenient bit and driver installation or removal. Simply twist the chuck ring either direction to loosen or tighten the grip and insert or remove the bit. CARRYING CASE- The entire kit comes in a 600D Oxford cloth bag. 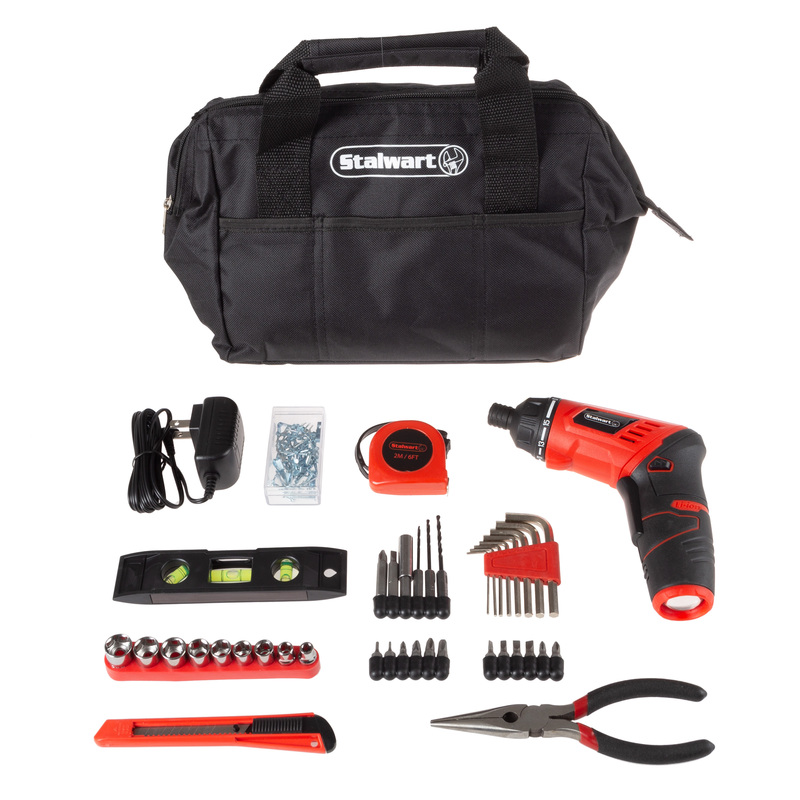 The opening of the bag opens wide for easy access to your drill and bits. It’s great to keep in your truck, RV or garage. 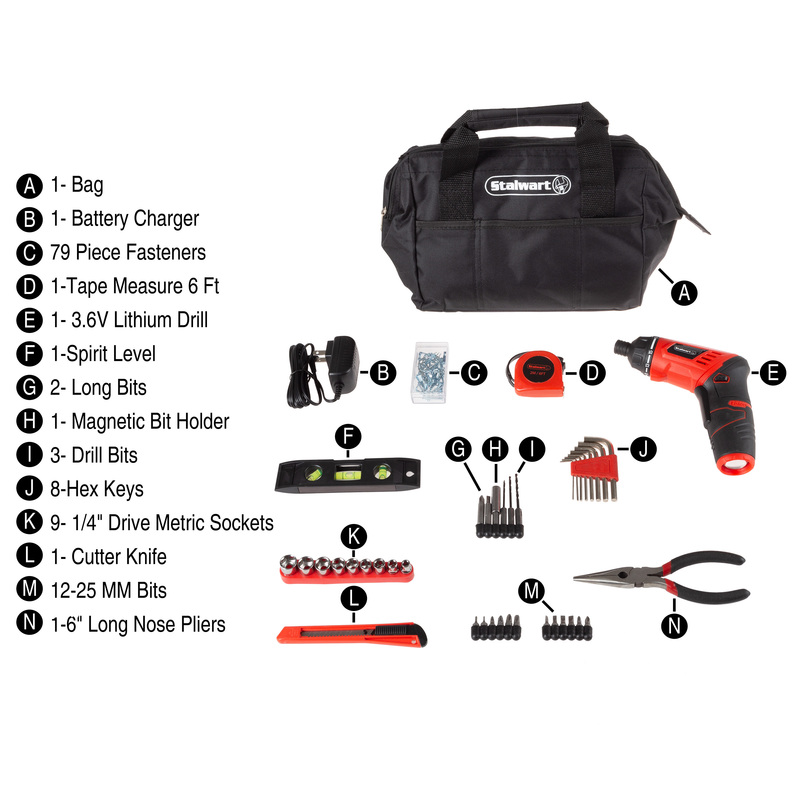 121 PIECE ACCESSORY KIT- Take on any DIY or household project with this extensive accessory kit. It includes screwdriver bits, drill bits and fasteners. PRODUCT DETAILS- Battery: 3.6 Volt Lithium Ion. 15+1 Torque Settings. Carrying Case Included. 121 Pieces. Color: Black, Red. Drill Dimensions: L 7” x W 2" x H 7” angled. Extends:7” x 9.25”. Bag Dimensions: 11” x 7” x 8”. Opening Dimensions: 12” x 8” x 8”.